Well, even with 9,000mi of backpacking, there’s always a time for some firsts. 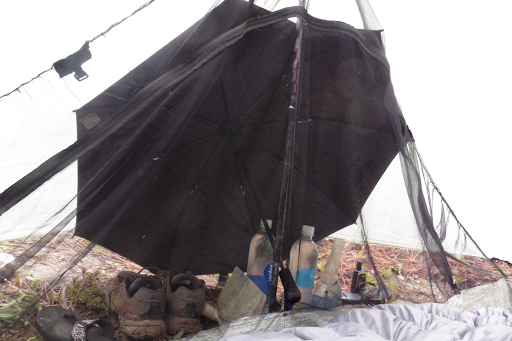 It rained all night last night and we awoke to more steady rain and 40F in my tent…so 30s outside. It did not look enjoyable out there. At 5:45am, our usual pack up time, Gavin and I discussed options for attacking this final day. My stubbornness saw no options other than to pack up and gut out the 21mi left to Lee Pass. Gavin does not have rain pants for this cold weather and was worried about hypothermia. I knew it wouldn’t be fun at all, but didn’t see any other options. We tried to troubleshoot Gavin’s lack of rain pants for a bit and agreed to give it a shot and leave at 7:30am. We started to pack up slowly. I needed to dig a hole and did not want to go outside. I have my umbrella opened up in my vestibule for bonus protection and realized that it gave me just enough space to dig a hole right there! I successfully dug a deep hole as to not have any mistakes and managed to go to the bathroom without leaving the comfort of my tent. I one upped the peeing in the Ziploc strategy and am so proud! Mission accomplished! Here’s a photo of the umbrella in the vestibule. 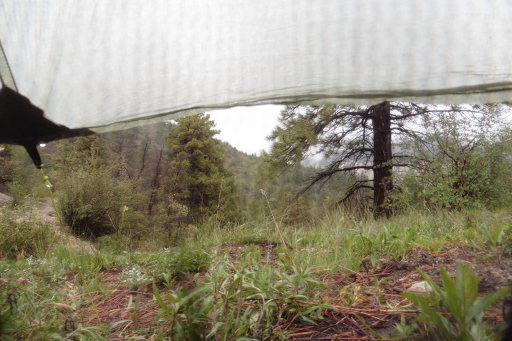 Even if it stopped raining, what we had ahead of us was mostly valleys and walking low where the rain has funneled over the night. 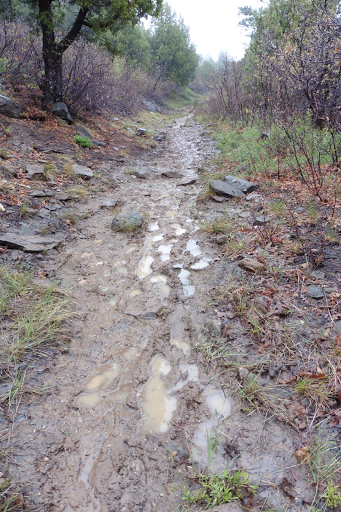 Walking up high yesterday was a slip n slide on clay mud with shoes two pounds heavier than they normally are, so we couldn’t even imagine how bad it would be down low. I started thinking of the poor group we saw last night and what they must be doing. Then I realized that they were next to a trailhead and felt relief for them if they wanted to get out…then it hit me that we were just one mile from that same trailhead! 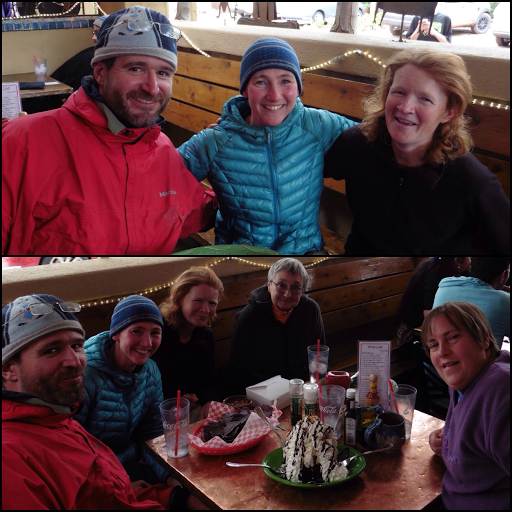 It is Saturday and our original plan was that Tumbleweed and Lori (from Kanab) were going to meet us at the trailhead at the end of the day to bring me my car and go out for a celebratory dinner. 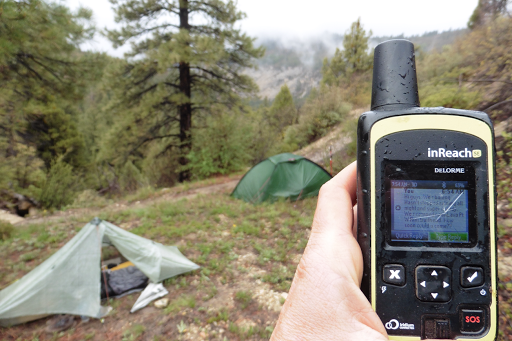 With my Delorme InReach SE device, I’m able to text anyone, even when I don’t have cell reception. I have absolutely loved this thing! It uses a satellite system and connects to my phone via bluetooth if I want. I texted Lori and Trish(typing is easy on the phone and clunky on the actual DeLorme) and waited for their reply as we were huddled warm and dry in our sleeping bags. In the photo, you can see we are socked in with the clouds and fog. The InReach screen is cracked because I freakin dropped it right on a rock last week when I had it in my hand and caught my foot on one of my tent guy lines, gawh! It was so early that it took an hour before they saw the text. They said they’d meet us in a couple hours, so I got time to watch a show! The other night, I got to episode 8 of season one of House of Cards and found out that I had accidentally downloaded two episodes with no volume. I put House of Cards on hold and moved over to the most recent season of Homeland, which I completely missed out on this past fall, but I’ve been wanting something lighter. I moved over to the new hit show of the year, Empire. Oh man, how addictive! I watched most of the first episode and totally get the hype. That will be a fun ride I’m looking forward to! We started packing up at 9:30am and coincidentally, the rain died down. If this was on the official Hayduke, I wouldn’t even entertain the idea of bailing early, but this was a bonus leg in which we’ve already seen all the best parts. Why make a great trip end on a sour note when we can finish and get straight to the celebratory meal? I have no regrets on this one and am happy to have dodged a day of uncomfortable hiking. I have a habit of pushing a good thing too far and making it unenjoyable, so I’m actually proud of myself for knowing when enough was enough this time. Here we are in our full on cold rain gear. 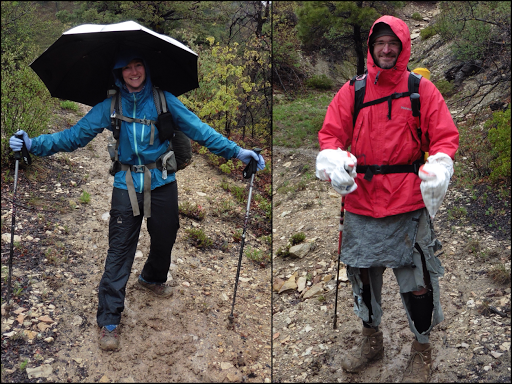 Notice Gavin’s shredded pants from the Grand Canyon and his waterproof “gloves” made from us postal shipping bags, which are Tyvek and Gavin uses to dry bag his gear. Here is a photo of the fun we’d be missing out on for 20+mi. This appears to look like regular puddles…but then you find out they are slick clay mud that suctions your shoes…um, no thank you. Tumbleweed and Lori got stuck in Zion holiday weekend traffic, so we continued hiking up the road to stay warm. 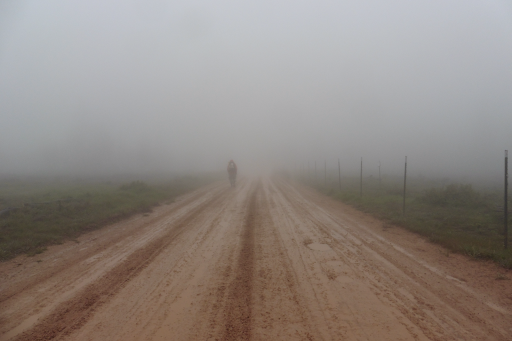 The fog was so thick, it was about a 20yd visibility. 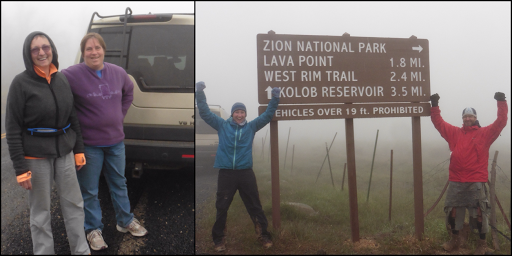 With all that Tumbleweed and Lori did for us this hike, we may have to call it a supported hike, ha! We had to get a celebratory finish photo at the road sign. It was pretty glorious ot get in the heated car. The temperture gauge in the car read 35F outside. Lori’s car had heated seats in the back…can we say heavenly!? We went to Springdale, next to Zion, and had our celebratory lunch meal. We all ordered steak, but Gavin. I love celebrating the end of a thru hike with a steak. It’s one of the few times, I can actually eat all of it. When we got to town, I had a message from Wyoming that she was there too. She doesn’t have a phone, but we were able to call the library and track her down there and she came to join the celebration. She plans to leave tomorrow to do the traverse we cut short today, but yesterday she became the first female to solo hike the Hayduke. SO BADASS!!!! Way to go Wyoming!!! I applied for online lottery permits for two of the most popular hikes in the park, the Narrows and the Subway. I found out today that I got in for the Narrows hike the day after tomorrow. My plan is to take a well needed zero tomorrow and then hike the Narrows…the problem is that with all the rain, the road to get to the top of the Narrows is most likely closed. I’m crossing my fingers for unforcasted sun to dry out the road tomorrow and if the road isn’t open, I might hike in and out from the bottom a bit, or just leave it for another visit. I’m pretty tired and feel like this trip is complete as it is right now. I went to the visitors center to try to get my permit while I was there (even though they only allow it the day before trips) and did get denied and will have to return tomorrow to pick it up. They do it for safety reasons so people are aware of the most recent conditions before going. While I was at the counter, a person next to me recognized me and asked if I was Wired. He told me he was also a thru hiker and gave me his trail name, which I wasn’t familiar with. After talking a bit, he mention the 14ers hike and I realized who I was talking to! 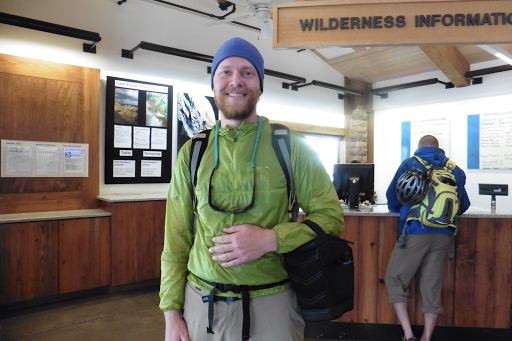 It was Junaid Dawud, one of the two guys who concieved of and thru hiked all 58 of Colorado’s 14ers in 2013. 1,300mi over 3 months with over 300,000ft of elevation gain, Their website is 14ers Thruhike and I’ve looked at it many times wondering if I’d ever be up for that challenge. An amazing feat, one I’m completely in awe of, and I couldn’t believe Junaid even knew who I was! We talked for awhile and could have talked all day I’m sure. Such a great coincidence that made both our days and further confirmed every decision I made today to lead up to that point. Again, I just love this hiker world! Great meeting you Junaid! As if all this wasn’t enough for a final day, I texted with Katherine, and she was also in Springdale. 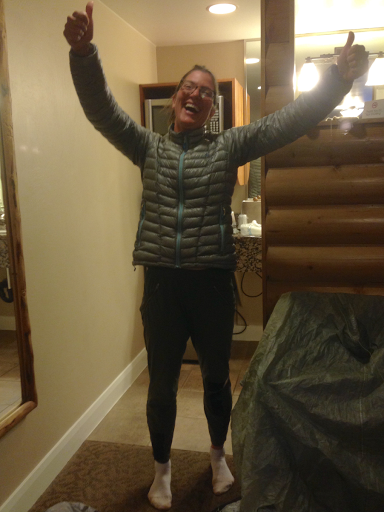 I was able to see her at her hotel as we both basked in the glow of having completed the trail. It was really fitting to see her today and for us to get some quality time. She was just ahead of us last night and chose to stick it out and finished the traverse. She will do an in/out of the bottom of the Narrows tomorrow and got a Subway permit for the next day. We may see each other one more time before we both leave, but this really might be it. We had to get a celebratory finish photo! I want to give a big THANK YOU to Katherine for all the work she’s put into this hike that many of us current and future hikers will benefit from. All of the alternates and bonus hikes most of us did were done by previous hikers, but Katherine was the one to really bring it all together and do the legwork to make them a reality. I was already overwhelmed by the details and had looked a very few of the bonus alternates, so I want to thank Katherine for doing all that legwork and sharing it with the hikers this year. Even when she knew it would limit her solo experience that she craved so much. She also track logged the whole trail and kept detailed notes to waypoint and update the essential water chart, which will be used to update both Li’s maps and Skurka’s bundle (which hasn’t been updated in 6yrs!). 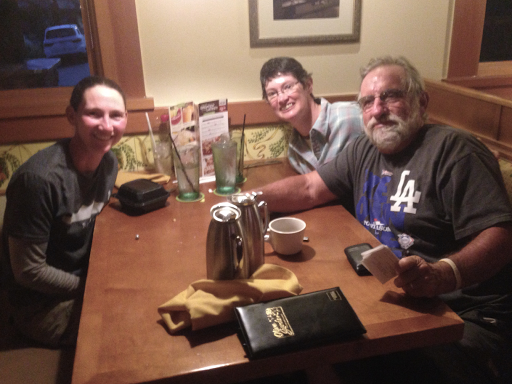 After seeing Katherine, I needed to make the 1hr drive to St George, where I was being hosted by blog follower Ellen and her husband George. It is pretty surreal to be done and it’s just now sinking in. 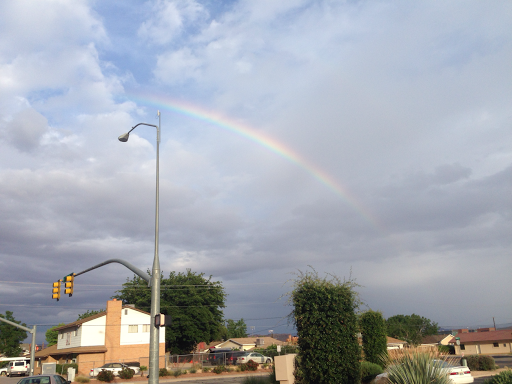 We went out to dinner and on the way, saw the elusive rainbow I’d been looking for all trail! THANK YOU to Ellen and George for housing me on my final day and for my zero tomorrow. I hope to get my slideshow up from this last section tomorrow. We had a great dinner and it’s hard to believe how much happened today since I woke up at 5:45am in a tent in the rain. What a whirlwind of a great day!